To celebrate two of the all-time tastiest foods – sandwiches and cheese – Tillamook Cheese’s Loaf Love Tour has partnered with four Salt Lake City restaurants for Sandwich Week. Each spot is offering a cheesy sandwich special featuring award-winning Tillamook Cheese. The Loaf Love Tour will also be making a special appearance at each restaurant during the week so keep an eye out for their adorable mini-buses. Tillamook Sandwich Week Special: Tillamook Monterey Jack Chicken Philly ($6.49) – Little Dave’s Deli will also be featuring a homemade Tillamook Cheddar and Broccoli soup during Sandwich Week. 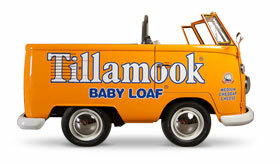 Tillamook’s Loaf Love Tour, the second annual cross-country event dedicated to “bringing tasty cheese to the people” will be in the Salt Lake City area until September 10th. To see the tour’s full & detailed schedule of stops, please visit www.LoafLoveTour.com.